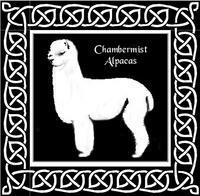 Chambermist Cottage is an alpaca farm located in Culver, Oregon owned by Janis McFerrin. CHAMBERMIST COTTAGE FARM is working to improve and maintain elite quality alpacas for the industry through carefully selected breedings. Fleece quality is of utmost importance without compromising conformationally correct structure. We want functional animals that still could live hardy on the altiplano of the Andes mountains. 2009 was our first season in production. Our first cria, "Farrah", did not disappoint us. See Chambermist Invincibly Angelic's listing for her background heritage. We had luck on our side with all 3 cria for that year born easily, healthy and all females! We feel we are off to a great venture. 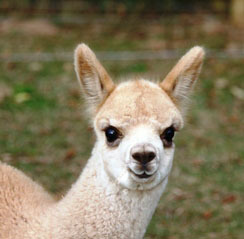 Already have found the magic in owning and breeding alpacas and the wonders they gives us everyday as farm livestock. In addition, the bonus of new found friends, all sharing their love and interest in alpacas. The industry did not disappoint us, even in these trying economic times.